Woodbrooke Good Lives Blog: My part in the pilgrimage to Paris. My part in the pilgrimage to Paris. This passage from George Fox is one of my favorites in Quaker Faith and Practice. To walk cheerfully answering that of God in everyone. 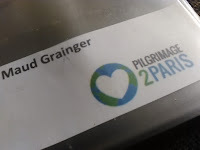 Well last week I set off with 44 other pilgrims from St Martin in the Field towards Paris. I had planned and prepared to walk for a few days. The first day was through London and into Surrey. 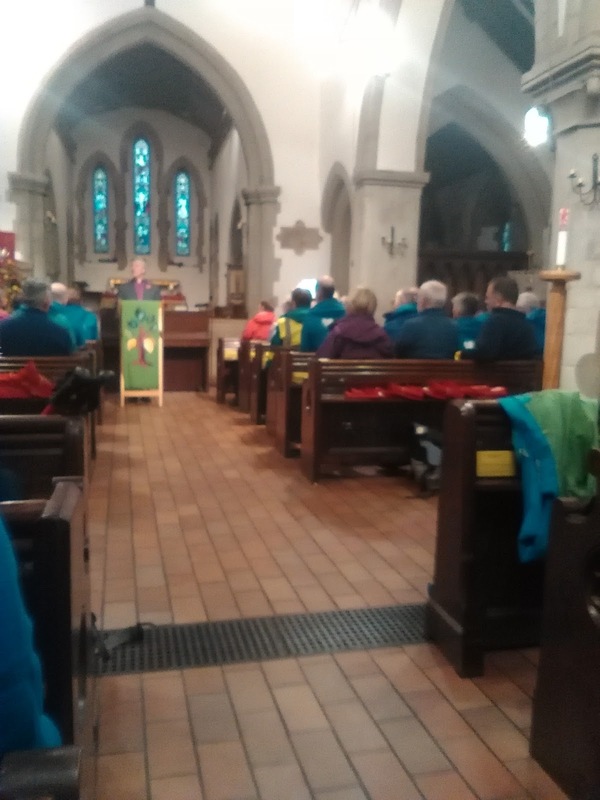 We set off after a service and it felt like a celebration. We passed the Houses of Parliament, crossed the river, and a mile or so down the road were cheered by staff from the Christian Aid offices. Another mile on and perhaps the most touching part of the day was hearing singing as we walked down the road, as we approached, students from a primary school were on the road singing us on our way and playing instruments. They walked down the road with us to their local church where we gathered on the street for a second service. Walking through London was incredible, one minute you are passing Big Ben, then through estates, parks, past students and commuters on their way home. Some commented, this is modern pilgrimage. It's not about a nice walk in the countryside, this is life - its business parks as well as fields. There is no hiding, you walk through it all. On the way we stopped at churches for lunch, afternoon break and then for sleep and this was a pattern to be repeated. So many offered so much time and hospitality and it all added to the community and sense of pilgrimage. 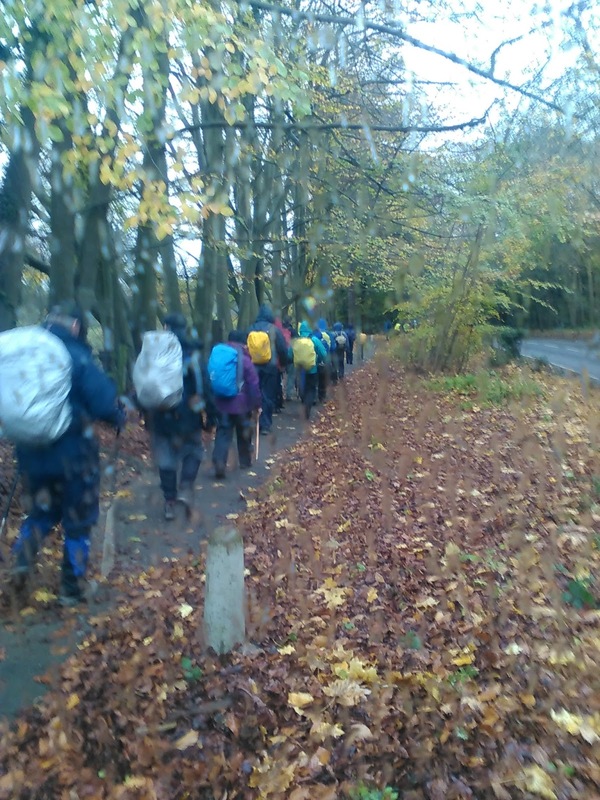 As we walked through London, I thought about something I had written in my first blog, that this was an organised pilgrimage because any walk could be a pilgrimage. I now feel that any walk can be but not every walk is, there is something about walking with others for a shared purpose. It is something else. We woke up the following morning to the news of the attacks in Paris, suddenly Paris wasn't just the final destination or the the location of the climate change talks. Everything changed. It was a rainy day, and one of the longest walks. We set off after short prayers and after expressing sadness and shock, there wasn't much else anyone could say. We were informed that a decision would be made in the next few days about what would happen and how far we would go in terms of the pilgrimage. It was a head down and walk kind of a day. I am home now, earlier than anticipated because on day 1 I managed to not notice a blister and it had popped before I knew it, I struggled to put my shoe on day 2 and so with tears welling behind my eyes said I had to withdraw. I could sense all those feelings that bubble up inside me, and inside I called myself a failure and then felt guilty for thinking that on such a day. One of my personal challenges is to think less negatively about myself and not compare my efforts with others. I must do what love requires of me, and in this case love required me to walk and walk I did. Sometimes what love requires of us isn't what we can do or what we want to do, its what we have to do. The experience will stay with me, although I feel inadequate to find words. A few lasting memories will be the sense of community, the feelings of embodying my witness, a talk on the Pope's Encyclical Laudato Si on the second evening and the sense of comfort and discomfort of following one of those nudges from God. My plan now is to give my foot some time to heal and then to continue and to do a walk every day of the pilgrimage to be with the group in heart and spirit. Climate Change connects us all, affects us all. Those meeting at the UN talks need strength and encouragement to make the decisions the world needs and so whatever you do, I urge you to do something. I shall continue to walk, to attend local events and talks and to pray. My last morning I awoke early, I have never seen a cross appear as if out of nowhere, but this morning I saw a cross as light came through the drawn curtains. A cross with an extra line as if forming an arrow pointing in. An arrow pointing inward towards Jesus, maybe it was just early in the morning but this felt like a clear sign. Keep listening, keep doing. The world needs both the comtemplatives and the prophetics amongst us. 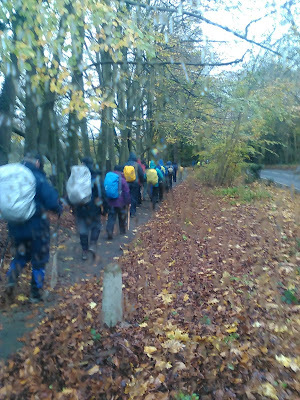 To follow the pilgrims, search #pilgrimage2paris on twitter, and here for you tube videos from Operation Noah. Thanks to everyone for your love support and encouragement. Well done Maud! Thanks for this very moving account. We have been praying for you here at Woodbrooke. The attacks in Paris have left me with a horrible feeling of powerlessness. What can we possibly do? I've been reminded that conflict in the Middle Eastern is fuelled by drought. Climate change activism isn't just about saving the polar bears, it's about peace as well. Thanks Maud for faithfully following your Guide. Well done Maud, And thank you for sharing. Hope your foot gets better soon. Much love.